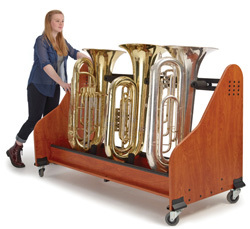 The perfect way to move and store any combination of tubas and sousaphones safely and securely. It lets you hold a full range of instrument sizes and easily adjusts. Heavy-duty casters with locking mechanisms keep the rack stable for fixed storage. Our three Sousaphone racks work great! They’re spaced appropriately for four Sousaphones and they can also hold tubas. The racks help organize everything and are easy to move.